A 4D-printed gripper grabs an object when the temperature is optimal. Photo courtesy of Qi (Kevin) Ge. A research project undertaken at MIT and Singapore University of Technology and Design succeeded in developing 3D-printed structures that can be physically manipulated in extreme ways and then spring back to their original shapes seemingly on demand when heated to a particular temperature. The approach was capable of creating high-resolution features just a few microns large, leading the engineers involved in the project to predict applications for their findings in medicine, among other fields. As described in "Multimaterial 4D Printing with Tailorable Shape Memory Polymers," the work involved producing objects composed of multiple materials with "active" components — printable shape-memory materials — that respond to heat, light or electricity. The researchers referred to this as "4D printing" — 3D printing with the addition of change over time. On the material side, the researchers are especially intrigued by "shape memory polymers" that can switch between two states: a low-temperature, harder, amorphous state, and a high-temperature, soft, rubbery state. A stretched or bent shape can be locked into place at room temperature and then snap back into its original form when it's heated up even slightly. Up until now 3D printers have been able to create structures with details as small as a few millimeters. But this project required the capability of printing each at smaller scales. "The reality is that, if you're able to make it to much smaller dimensions, these materials can actually respond very quickly, within seconds," said Nicholas Fang, associate professor of mechanical engineering at MIT, and a member of the research team, in an article on the project. "For example, a flower can release pollen in milliseconds. It can only do that because its actuation mechanisms are at the micron scale." So the team developed a 3D printing process they call "high resolution projection microstereolithography," which uses light from a projector to print patterns on successive layers of resin. "We're printing with light, layer by layer," Fang says. "It's almost like how dentists form replicas of teeth and fill cavities, except that we're doing it with high-resolution lenses that come from the semiconductor industry, which give us intricate parts, with dimensions comparable to the diameter of a human hair." They settled on a recipe of two polymers to create the shape-memory material used for their light-defined structures. When mixed together and cured, the resulting composition can be stretched and twisted without breaking. And, within a specific temperature range (between 104 and 356 degrees Fahrenheit), it will reassume its original printed form. 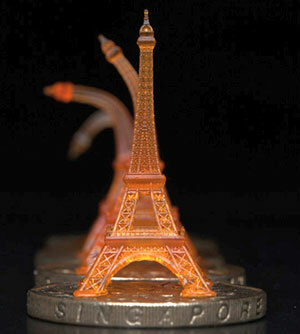 An Eiffel tower is bent, then straightens on its own to its original form after being heated through a Singapore dollar coin. Photo courtesy of Qi (Kevin) Ge. The examples concocted to illustrate the capabilities are fun ones: a tiny Eiffel tower that stretches down and then springs back into form (figure, right); or a minigripper that opens to get around an object and closes to grab it (seen at the top of this article). But the possible applications are more serious. For example, a drug capsule could open up on early signs of infection. "We ultimately want to use body temperature as a trigger," Fang explained. "If we can design these polymers properly, we may be able to form a drug delivery device that will only release medicine at the sign of a fever." Eventually, added fellow researcher Qi "Kevin" Ge, now an assistant professor at the Singapore institution, the method will accommodate the stretching of objects too. "Our method not only enables 4D printing at the micron-scale, but also suggests recipes to print shape-memory polymers that can be stretched 10 times larger than those printed by commercial 3D printers," Ge said. "This will advance 4D printing into a wide variety of practical applications, including biomedical devices, deployable aerospace structures and shape-changing photovoltaic solar cells."